Teach an old dog new tricks? ABSOLUTELY! Learn new techniques with the INSTRUCTORS OF ESF LA CLUSAZ who will take pleasure in ACCOMPANying YOU IN YOUR PROGRESS or simply guide you on your outing. From 18 years old, in group or private lessons, you will discover all the facets of our ski resort: Off-piste skiing, Snowboarding, Nordic... whether its your first or return visit to La Clusaz, ESF will help make it memorable for you. 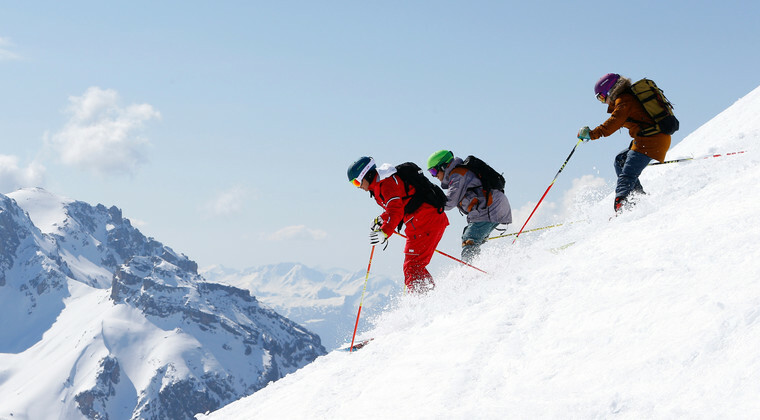 Our group lessons offer a great way to learn to ski with others of the same level. Learn, progress and have fun! Safely accompanied by a qualified ESF instructor. Your off-piste adventure starts here! Our instructors will take you on the most beautiful off-piste routes available and help you to progress and master all terrains where needed. Receive the training of champions! Technical advice from our experts and progression to compete with others! A pleasure at any age! Off piste, in the snow park or on piste. For all levels our snowboard lessons are fun and the progress is rapid! Come and enjoy a stroll through nature! We have fabulous outings with the most amazing views. We offer short and flexible mini break options for adults. ESF has specially tailored packages for adults looking for a quick getaway! 3 exceptional packages on offer !